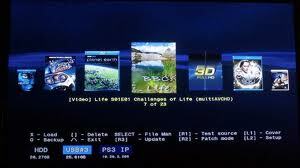 Today Dean K Releases yet another UPDATE FOR Multiman, PS3 Backup Manger. - Change font properties / functions in all modes. - Maximum number of games in AVCHD + “gam modes: 960 (before 640). - Maximum number of entries per column XMMB: 3200.
limit of characters for the parameter column XMMB [option selected]: 36 (before 32 German / French). - Moving [selected option] at the far right. - 20MB of RAM freed and reallocated some of them to increase the number of games max input / xmmb. - This update should correct “Not enough memory for web browser” in some users. If this is not the case, use the original theme. - Added checks for updates Multiman downloaded (to avoid installing files PKG incomplete / damaged). - Added verification of downloaded covers (to avoid accepting file incomplete / damaged files downloaded). - The menu commands in the file manager has changed a bit. - Legend in most display modes using the current settings of localization. - Vibration alert added lice ‘Delete’ game / folder. - Includes all languages, with the latest versions displayed by the translators. (Dutch, Portuguese, Arabic …).